Your HVAC system is probably one of the most important things about being a homeowner. Owning a heating or cooling system means the responsibility of taking care of it, and let’s face it, not all of us do a perfect job of it. It’s only natural that over time, you’ll develop some bad habits that could be taking years off the life of your system or causing spikes in your energy bills. Here at Davis Heating & Cooling, we want you to get the absolute most out of your system that you can. 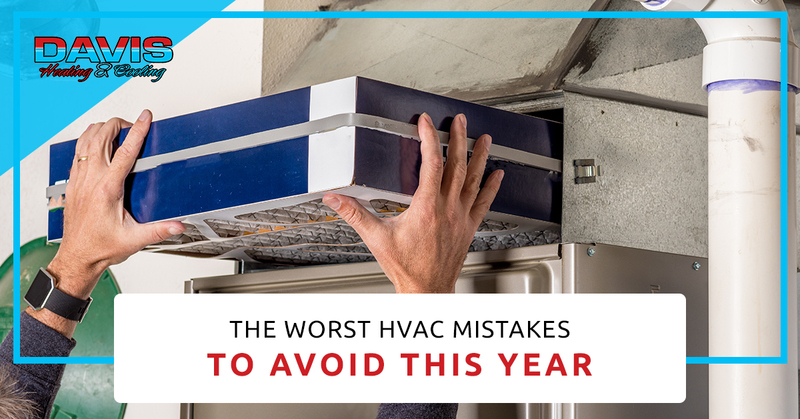 If you’d like to learn about some of the most common (and worst) HVAC mistakes out there, read on. If you’re ready for a consultation, give us a call today. Although you may think you have a master plan for saving money on your energy bills, constantly messing with your thermostat is probably not helping. Similar to most electronic devices, vehicles, or anything that can start up and shut down, HVAC systems will wear out more quickly when they’re constantly turned on and off. It’s better to run your system on low for a longer period of time than full blast for a few minutes at a time. Closing vents not only prevent conditioned air from escaping the ducts, but it can also damage your system. This can reduce the overall life of your system and even lead to frozen evaporator coils. Remember that furniture and anything else placed on the vents can have a similar effect, so be careful to avoid this. Most HVAC companies will recommend homeowners change their own air filters, but that’s about the extent of the DIY repairs. Why? There are many different types of HVAC systems and each works very differently from the other. It takes many years to be efficient at repairing a furnace or AC unit so it’s best to leave it up to the professionals. The problem with high energy bills is that they aren’t always obvious. Your bills could be gradually increasing in price each year without you noticing it and this is very likely you’re not replacing your air filters. Depending on the MERV rating of your filter, you’ll want to have it replaced between a month and six months. You should speak with your local heating and cooling company for more information on this. Preventative maintenance means scheduling an HVAC visit even when there doesn’t appear to be a problem with your system. This is important because it means avoiding major issues with your system before they happen. Fortunately, here at Davis Heating & Cooling, we’ve been in the industry for over 30 years and work with all types of systems. Spring is the perfect time to get your AC fixed in Flemington because the temperature has warmed up a bit, but it’s not too hot to actually get anything done. Give us a call or fill out our contact form today.